The Norwegian heavy water sabotage (Bokmål: Tungtvannsaksjonen, Nynorsk: Tungtvassaksjonen) was a series of operations undertaken by Norwegian saboteurs during World War II to prevent the German nuclear weapon project from acquiring heavy water (deuterium oxide), which could have been used by the Germans to produce nuclear weapons. In 1934, at Vemork, Norway, Norsk Hydro built the first commercial plant capable of producing heavy water as a byproduct of fertilizer production. It had a capacity of 12 tonnes per year. During World War II, the Allies decided to remove the heavy water supply and destroy the heavy water plant in order to inhibit the German development of nuclear weapons. Raids were aimed at the 60 MW Vemork power station at the Rjukan waterfall in Telemark, Norway. Prior to the German invasion of Norway on 9 April 1940, the Deuxième Bureau (French military intelligence) removed 185 kg (408 lb) of heavy water from the plant in Vemork in then-neutral Norway. The plant's managing director, Aubert, agreed to lend the heavy water to France for the duration of the war. The French transported it secretly to Oslo, on to Perth, Scotland, and then to France. The plant remained capable of producing heavy water. The Allies remained concerned that the occupation forces would use the facility to produce more heavy water for their weapons programme. Between 1940 and 1944, a sequence of sabotage actions, by the Norwegian resistance movement—as well as Allied bombing—ensured the destruction of the plant and the loss of the heavy water produced. These operations—codenamed Grouse, Freshman, and Gunnerside—finally managed to knock the plant out of production in early 1943. In Operation Grouse, the British Special Operations Executive (SOE) successfully placed four Norwegian nationals as an advance team in the region of the Hardanger Plateau above the plant in October 1942. The unsuccessful Operation Freshman was mounted the following month by British paratroopers; they were to rendezvous with the Norwegians of Operation Grouse and proceed to Vemork. This attempt failed when the military gliders crashed short of their destination, as did one of the tugs, a Handley Page Halifax bomber. The other Halifax returned to base, but all the other participants were killed in the crashes or captured, interrogated, and executed by the Gestapo. In February 1943, a team of SOE-trained Norwegian commandos succeeded in destroying the production facility with a second attempt, Operation Gunnerside, later evaluated by SOE as the most successful act of sabotage in all of World War II. These actions were followed by Allied bombing raids. The Germans elected to cease operation and remove the remaining heavy water to Germany, but Norwegian resistance forces sank the ferry carrying the water, SF Hydro, on Lake Tinn. Enrico Fermi and his colleagues studied the results of bombarding uranium with neutrons in 1934. The first person who mentioned the idea of nuclear fission in 1934 was Ida Noddack. 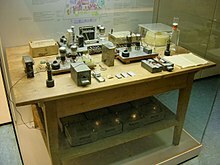 Four years after the Fermi publication, in December 1938, Lise Meitner and Otto Frisch correctly interpreted the radiochemical experimental results of Otto Hahn and Fritz Strassmann as evidence of nuclear fission. News of this discovery spread quickly among physicists and it was realised that if chain reactions could be controlled, fission might lead to a new source of great power. What was needed was a substance that could "moderate" the energy of the secondary neutrons emitted by fission so that they could be captured by other fissile nuclei. Heavy water and graphite were the prime candidates for moderating the energy of neutrons. Plutonium-239 (239Pu) makes an effective weapons material (although requiring an implosion-type mechanism as a simpler Thin Man gun-type bomb is not feasible). Heavy water has been demonstrated as an effective moderator for 239Pu production. Heavy water may be separated from ordinary water by electrolysis. In nuclear weapon development, the main problem is securing sufficient "weapons grade" material. In particular, it is difficult to acquire either fissile isotopes of uranium-235 (235U) or of 239Pu. Weapons grade uranium requires mining, extracting and enriching natural ore. Alternatively, plutonium can be "bred" in reactors fueled by unenriched uranium, which requires chemical separation of the 239Pu produced. Unlike the Allies, who pursued both the enrichment of uranium and the production of plutonium, German scientists only focused on plutonium production, as this method was less expensive. Although the most common isotope of uranium, uranium-238 (238U), can be used as secondary fissionable material in hydrogen bombs, it cannot be used as the primary fissile material for an atomic bomb.238U can be used to produce 239Pu, through the fission of 235U which produces neutrons, some of which will be absorbed by 238U creating 239U. After a few days the 239U will decay, turning into weapons-usable 239Pu. The Germans found that if graphite was used as a moderator a chain reaction could not be sustained, and abandoned it as a possible moderator. They were unaware that this was due to impurities, and did not test ultra-pure graphite, which would have been suitable. They instead settled on the heavy-water-based reactor design. A heavy-water-moderated nuclear reactor could be used for nuclear fission research, and, ultimately, to breed plutonium from which a bomb could be constructed. In normal water, there is only one deuterium atom for every 6,400 hydrogen atoms, but deuterium is more prevalent in the residue of water used as an electrolyte. An analysis of the residues from the Vemork hydroelectric plant, a large-scale nitrate production plant using the Birkeland–Eyde process, showed a hydrogen/deuterium ratio of 48, most of the deuterium being bound in HDO molecules. Leif Tronstad, then a lecturer at the Norwegian Institute of Technology and Jomar Brun, head of the hydrogen plant put forward a proposal in 1933, the year heavy water was first isolated, for a project, which was accepted by Norsk Hydro; production started in 1935. The technology is straightforward. Heavy water (D2O) is separated from normal water by electrolysis because the difference in mass between the two hydrogen isotopes translates into a slight difference in the speed at which the reaction proceeds. To produce pure heavy water by electrolysis requires a large cascade of electrolysis chambers, and consumes large amounts of power. Since there was excess power available, heavy water could be purified from the existing electrolyte. As a result, Norsk Hydro became the heavy water supplier for the world's scientific community, as a by-product of fertilizer production, for which the ammonia was used. Hans Suess was a German adviser to the production of heavy water; he had assessed the Vemork plant as being incapable of producing militarily useful quantities of heavy water in less than five years at its then capacity. French research considered production of 239Pu using reactors moderated by both heavy water and graphite. Preliminary French research indicated that the graphite which was then available commercially was not pure enough to serve the purpose, and that heavy water would be required. The German research community had reached a similar conclusion and in January 1940 had procured additional heavy water from Vemork. The German firm IG Farben, which was a partial owner of Norsk Hydro, had ordered 100 kg (220 lb)/month; Norsk Hydro's maximum production rate was then limited to 10 kg (22 lb)/month. In 1940, the "Deuxième Bureau" (French military intelligence) directed three French agents, Captain Muller and Lieutenants Mossé and Knall-Demars, to remove the world's extant supply, 185 kg (408 lb) of heavy water from the Vemork plant in then-neutral Norway. The Norsk Hydro General Director, Axel Aubert, agreed to lend the heavy water to France for the duration of the war, observing that if Germany won the war he was likely to be shot. Transportation was difficult as German Military Intelligence (the Abwehr) maintained a presence in Norway and had been alerted of ongoing French activities in Norway (although they had not been specifically warned about heavy water). Had they become aware of the shipment, they might have attempted to intercept it. The French transported it secretly to Oslo, to Perth in Scotland, and then to France. When France was invaded the French nuclear scientist Frédéric Joliot-Curie took charge of the material, hiding it first in a Banque de France vault and then in a prison. Joliot-Curie then moved it to Bordeaux, where it, plus research papers and most of the scientists (Joliot-Curie remained in France) boarded the British tramp steamer Broompark, which was one of the many merchant ships involved in saving over 200,000 troops and civilians in the three weeks after the evacuation at Dunkirk. The ship already had industrial diamonds, machinery and a number of British evacuees aboard. SS Broompark delivered its passengers and cargo, together with all of the free supply of heavy water, to Falmouth on 21 June. The award of an OBE to Captain Paulsen was recorded in the London Gazette of 4 February 1941. Crucial to the success of the mission was the role played by Charles Howard, 20th Earl of Suffolk. Although the ready inventory of heavy water was removed, the plant remained capable of producing heavy water. In investigations of collaboration launched by Norwegian authorities after the war, Norsk Hydro management's collaboration with the Germans was considered. General Director Aubert's cooperation with the French aided the Norsk Hydro case. Operations for the destruction of the Vemork plant were mounted by the Combined Operations Headquarters starting in October 1942. The plan consisted of two operations: the first would drop a number of local Norwegian people into the area as an advance force (Operation Grouse), and once they were in place a party of British engineers would be landed by military glider to attack the plant itself (Operation Freshman). On 19 October 1942, a four-man team of Special Operations Executive (SOE)-trained Norwegian commandos parachuted into Norway. From their drop point in the wilderness they had to ski a long distance to the plant, so considerable time was given to complete this part of the mission, known as Operation Grouse. This plan, unlike prior failures, included the team's studying and memorising blueprints. After the delays, once the Norwegian Grouse team managed to make contact with the British, the British were suspicious, as they had not heard from the SOE team for a long time: they had been dropped at the wrong place and had gone off course from there several times. The secret question took the form of: "What did you see in the early morning of (a day)?" The Grouse team replied: "Three pink elephants." The British were ecstatic at the success of the Norwegian team's insertion, and the next phase of operations commenced. On 19 November 1942, Operation Freshman followed with the planned glider-borne landing on frozen lake Møsvatn near the plant. Two Airspeed Horsa gliders, towed by Handley Page Halifax bombers, each glider carrying two pilots and 15 Royal Engineers of the 9th Field Company, 1st British Airborne Division, took off from RAF Skitten near Wick in Caithness. The towing of gliders had always been hazardous, but in this case it was made worse by the long flying distance to Norway and poor weather conditions which severely restricted visibility. One of the Halifax tugs crashed into a mountain, killing all seven aboard; its glider was able to cast off, but crashed nearby, resulting in several casualties. The other Halifax arrived at the area of the landing zone, but although the conditions had substantially improved it was impossible to locate the landing zone, owing to the failure of the link between the Eureka (ground) and Rebecca (aircraft) beacons. After much endeavour and with fuel running low, the Halifax pilot decided to abort the operation and return to base. Shortly afterwards, however, the tug and glider combination encountered heavy cloud and in the resulting turbulence the tow rope broke. The glider made a crash landing, not far from where the other glider had come down, similarly inflicting several deaths and injuries. The Norwegians were unable to reach the crash sites in time, and the survivors eventually came into the hands of the Gestapo, who tortured them during interrogation (not sparing the badly injured) and later had them executed under Adolf Hitler's Commando Order. The unsuccessful raid alerted the Germans to a determined Allied interest in their heavy water production. The surviving Norwegian Grouse team thereafter had a long arduous wait in their mountain hideaway, subsisting on moss and lichen during the winter until, just before Christmas, a reindeer was encountered. British authorities were aware the Grouse team was still operational, and decided to mount another operation in concert with them. By this time the original Grouse team was being referred to as Swallow. On the night of 16 February 1943, in Operation Gunnerside (named after the village where SOE head Sir Charles Hambro and his family used to shoot grouse), an additional six Norwegian commandos were dropped by parachute by a Halifax bomber of 138 Squadron from RAF Tempsford. They were successful in landing, and encountered the Swallow team after a few days of searching on cross country skis. The combined team made final preparations for their assault, which was to take place on the night of 27/28 February 1943. Supplies required by the commandos were dropped with them in special CLE containers. One of these was buried in the snow by a Norwegian patriot to hide it from the Germans; he later recovered it and in August 1976 handed it over to an officer of the British Army Air Corps, which was conducting exercises in the area. The container was brought back to England and was displayed in the Airborne Museum at Aldershot, later part of the Imperial War Museum Duxford. Following the failed Freshman attempt, the Germans put mines, floodlights, and additional guards around the plant. While the mines and lights remained in place, security of the actual plant had slackened somewhat over the winter months. However, the single 75 m (246 ft) bridge spanning the deep ravine, 200 m (660 ft) above the river Måna, was fully guarded. The force elected to descend into the ravine, ford the icy river and climb the steep hill on the far side. The winter river level was very low, and on the far side, where the ground levelled, they followed a single railway track straight into the plant area without encountering any guards. Even before Grouse landed in Norway, SOE had a Norwegian agent within the plant who supplied detailed plans and schedule information. The demolition party used this information to enter the main basement by a cable tunnel and through a window. Inside the plant the only person they came across was the Norwegian caretaker (Johansen), who was very willing to cooperate with them. The saboteurs then placed explosive charges on the heavy water electrolysis chambers, and attached a fuse allowing sufficient time for their escape. A Thompson submachine gun was purposely left behind to indicate that this was the work of British forces and not of the local resistance, in order to try to avoid reprisals. A bizarre episode ensued when fuses were about to be lit: the caretaker was worried about his spectacles which were lying somewhere in the room (during the war new glasses were nearly impossible to acquire). A frantic search for the caretaker's spectacles ensued; they were found, and the fuses lit. The explosive charges detonated, destroying the electrolysis chambers. The raid was considered successful. 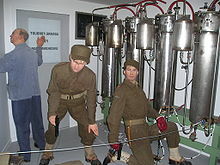 The entire inventory of heavy water produced during the German occupation, over 500 kg (1,102 lb), was destroyed along with equipment critical to operation of the electrolysis chambers. Although 3,000 German soldiers were dispatched to search the area for the commandos, all of them escaped; five of them skied 400 kilometres to Sweden, two proceeded to Oslo where they assisted Milorg, and four remained in the region for further work with the resistance. This attack stopped production for several months, although it did not damage the plant irreparably. The Vemork plant was restored by April, and SOE concluded that a repeat commando raid would be extremely difficult as German security had been considerably improved. Almost as soon as production restarted, the USAAF started a series of raids on Vemork. In November, the plant was attacked by a massed daylight bombing raid of 143 B-17 heavy bombers which dropped 711 bombs, causing extensive damage, although at least 600 missed the plant. On 16 and 18 November 35 B-24 heavy bombers from the 392nd Bomber Group based in Wendling, Station 118, attacked the hydro-electric power station at Rjukan with excellent coverage of the target. These missions were the longest for this bomber group, lasting 9½ and 10½ hours respectively. The need for ground assaults was reduced from a year earlier as there was now an available alternative of night bombing, which had previously been unrealistic owing to German air cover. The Germans were convinced that air raids would result in further serious "hits", and they decided to abandon the plant and move remaining stocks and critical components to Germany in 1944. Knut Haukelid, who was the only trained commando in the immediate area, was informed of the German plan to remove the heavy water and advised he would have to muster support and destroy the shipment. He recruited two people. They decided to sabotage a ferry that would be carrying the heavy water across Lake Tinn. One of the people he recruited recognised a ferry crew member and talked to him, taking this advantage to slip into the bottom of the ship and plant the bomb, after which he slipped away. 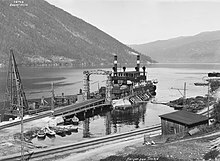 Eight and a half kilograms of plastic explosive with two alarm-clock fuses were fixed to the keel of the ferry, SF Hydro, which was to carry the railway cars with the heavy water drums across Lake Tinn. On 20 February 1944, shortly after setting off around midnight, the ferry and its cargo sank in deep water, finally capping the original mission's objective and halting Germany's atomic bomb development programme. Witnesses reported seeing steel drums floating after the sinking, leading to speculation that they did not really contain heavy water, but an examination of records after the war showed that some barrels were only half full, and therefore would have floated. A few of these may have been salvaged and transported to Germany. Despite the intention to minimize casualties, 18 people were killed. Twenty-nine survived. The dead comprised 14 Norwegian crew and passengers and four German soldiers. In 2005 an expedition retrieved a barrel, numbered "26", from the bottom of the lake. Its contents of heavy water matched the concentration noted in the German records, and confirmed that the shipment was not a decoy. However, the concentration of heavy water in a number of the barrels was too small to be of value to a weapons program, which might explain the absence of heavy security measures around the shipment, including why the ferry itself was not searched for delayed charges. In the film Heroes of Telemark, the locomotive and train is shown, somewhat implausibly, covered with German soldiers. In the Ray Mears BBC TV coverage it is stated that in fact the general in command had ordered this specific disposition of troops. Unknown to the saboteurs, a "Plan B" had been established by the SOE, who arranged a second team to attack the shipment at Herøya should the first attempt fail. The disassembled factory was later found in southern Germany during the closing stages of the war by members of the Alsos Mission nuclear seizure force. Recent investigation of production records at Norsk Hydro and analysis of an intact barrel that was salvaged in 2004 revealed that although the barrels in this shipment contained water of pH 14—indicative of the alkaline electrolytic refinement process, they did not contain high concentrations of D2O. Despite the apparent size of shipment, the total quantity of pure heavy water was limited, with most barrels only containing between 0.5–1% heavy water, confirming the success of the Operation Gunnerside raid in destroying the higher-purity heavy water. The Germans would have needed a total of about 5 t (5.5 short tons) of heavy water to operate a nuclear reactor, while the manifest indicated that there only 500 kg (0.55 short tons) of heavy water was being transported to Germany. Hence the Hydro was carrying too little heavy water to supply one reactor, let alone the 10 or more tons of heavy water needed to make enough plutonium for a nuclear weapon. With the benefit of hindsight, the consensus on the German wartime nuclear program is that it was a long way from producing a bomb, even if the Norwegian heavy water had been produced and shipped at the maximum rate. Nevertheless, the unsuccessful British raid (Freshman) and the feats of the Norwegian saboteurs (Swallow, Grouse, Gunnerside) made the top secret war against the heavy water production internationally known and the saboteurs national heroes. Source: Bascomb, Neal (3 May 2016). The Winter Fortress: The Epic Mission to Sabotage Hitler's Atomic Bomb. Houghton Mifflin Harcourt. pp. xiv–xv. ISBN 9780544368064. Retrieved 15 February 2018. Joachim Rønneberg was the last surviving member of the Gunnerside team; he died on 21 October 2018, aged 99. The New York Times reported that at 95 Rønneberg was "still mentally sharp ... and possessed of the unflappable calm that so impressed British military commanders more than 70 years ago". A 1962 book by John D. Drummond, titled But For These Men (ISBN 0705700453), tells a true account of two dramatic raids: one on the Norsk Hydro heavy water factory at Vemork, and another on the railway ferry "Hydro" to destroy Germany's heavy water production efforts. The book The Real Heroes of Telemark: The True Story of the Secret Mission to Stop Hitler's Atomic Bomb by Ray Mears, published by Hodder & Stoughton 2003 (ISBN 0-340-83016-6) describes the events from the perspective of the unique survival skills of the Norwegian commandos. It accompanied a BBC television documentary series, The Real Heroes of Telemark, which sticks more to the facts than the film it is named after. It also describes the survival aspects of the attack: how to survive for months in a mountain cabin. The book Skis Against the Atom (ISBN 0-942323-07-6) is a first-hand account by Knut Haukelid, one of the Gunnerside raiders who stayed behind. Jens-Anton Poulsson (Swallow/Grouse) has told the story in the book The Heavy Water Raid: The Race for the Atom Bomb 1942–1944, Orion forlag As (2009), ISBN 978-82-458-0869-8. The ill-fated Operation Freshman is covered extensively in two books: Richard Wiggan's Operation Freshman: The Rjukan Heavy Water Raid 1942, William Kimber & Co Ltd (1986), ISBN 978-0-7183-0571-0, and the more recent, Jostein Berglyd's Operation Freshman: The Actions and the Aftermath, Leandoer & Ekholm (2007), ISBN 978-91-975895-9-8. Richard Rhodes's Pulitzer Prize-winning book The Making of the Atomic Bomb includes details on the events in chapters 14–15. The raid is also the subject of the book, Assault in Norway: Sabotaging the Nazi Nuclear Program by Thomas Gallagher, published by Lyons Press (2002), ISBN 978-1-58574-750-4. This book is based on the author's interviews with many of the commandos. An account of Operation Gunnerside is told in The Winter Fortress: The Epic Mission to Sabotage Hitlers Atomic Bomb, by Neal Bascomb, published by Houghton Mifflin (2016), ISBN 978-0-544-36805-7. Damien Lewis's 2016 book Hunting Hitler's Nukes: The Secret Race to Stop the Nazi Bomb, ISBN 978-1-78648-208-2, covers the raid and the subsequent sinking of the SF Hydro in detail. The première of Kampen om tungtvannet on 5 February 1948. From left: Knut Haukelid, Joachim Rønneberg, Jens Anton Poulsson (shaking hands with King Haakon VII), Kasper Idland. A 1948 Norwegian film based on Operations Freshman and Grouse, called Kampen om tungtvannet, features performances by at least four of the original participants in the raid. A 1965 British film based on the Operation Gunnerside raid, titled The Heroes of Telemark. It features a performance by one of the original participants in the raid – as the Nazi pursuer of the escapees. A 1966 book by Czech author František Běhounek, titled Rokle u Rjukanu (Gorge at Rjukan), is a fiction inspired by the events. A 1979 Canadian movie and TV-series titled A Man Called Intrepid, based on the book of the same name by William Henry Stevenson. It features David Niven, Michael York and Barbara Hershey. In the 1999 game Medal of Honor, a fifth mission is named Sabotage the Rjukan Hydro Plant. Its four levels take action inside and outside of Rjukan Hydro Plant, where American Soldier is sabotaging production of heavy water, during WWII. A late 2003 game by Totally Games was released named Secret Weapons Over Normandy, a fiction game which has its story based off real life occurrences during World War II, features a segment which alludes to the plant and attempted raids. On 8 November 2005, the Corporation for Public Broadcasting – WGBH Educational Foundation in Boston, MA aired a program which documented the work of a team of underwater archaeologists exploring the sunken ferry, SF Hydro in Lake Tinn. In 2013, for the 70th anniversary of Operation Gunnerside, BBC News interviewed Joachim Rønneberg, the leader and last surviving member of the Gunnerside team. A six-episode TV mini-series titled The Heavy Water War (The Saboteurs in the UK) tells the story with a particular emphasis on the role of Leif Tronstad. This Norwegian-Danish-British co-production is in 6 episodes, the first of which was initially broadcast on 4 January 2015. In the 2014 game Enemy Front, one of the main missions takes place during the sabotage of the Vemork Heavy Water Plant. During this mission, the player is led by a character called "Lief Rønneberg", who is a homage to Joachim Rønneberg and its involvement in Operation Gunnerside. Another fictionalization is The Saboteur, a 2017 novel by Andrew Gross. In the 2018 game Battlefield V, a fictionalized version of the events are depicted as part of a single player mission known as "Nordlys" (northern lights in Norwegian). ^ a b c d e Dahl, Per F (1999). Heavy water and the wartime race for nuclear energy. Bristol: Institute of Physics Publishing. pp. 103–108. ISBN 07 5030 6335. Retrieved 12 July 2009. ^ Foot, M.R.D. (October 1984). The Special Operations Executive 1940–1946. BBC Books. ISBN 0-563-20193-2. ^ E. Fermi, E. Amaldi, O. D'Agostino, F. Rasetti, and E. Segrè (1934) "Radioacttività provocata da bombardamento di neutroni III," La Ricerca Scientifica, vol. 5, no. 1, pp. 452–453. ^ Ida Noddack (1934) "Über das Element 93," Zeitschrift für Angewandte Chemie, vol. 47, no. 37, pp. 653–655. ^ Weintraub, Bob. Lise Meitner (1878–1968): Protactinium, Fission, and Meitnerium. Retrieved on 8 June 2009. ^ Bernstein, Jeremy (2007). Plutonium: A History of the World's Most Dangerous Element. Joseph Henry Press. ISBN 0-309-10296-0. Retrieved 12 July 2007. ^ Powers, Thomas (1993). Heisenberg's War: the secret history of the German bomb. Alfred A. Knopf. ISBN 0-394-51411-4. ^ The heavy water concept was perfectly viable—one needs only consider the heavy water moderated production reactors at Savannah River Site's R-Reactor, P-Reactor, L-Reactor, K-Reactor, and C-Reactor, or Mayak's production reactors, to see compelling proof that heavy water is fully effective for plutonium production if available in sufficient quantities. ^ Per F. Dahl (1999). Heavy water and the wartime race for nuclear energy. p. 43. ISBN 0-585-25449-4. ^ "Vemork Heavy Water Plant – 1942–44". GlobalSecurity.org. Archived from the original on 6 August 2009. Retrieved 15 July 2009. ^ Andersen, Ketil Gjølme G. (2009). "Axel Aubert – utdypning". Store norske leksikon (in Norwegian). Oslo: Kunnskapsforlaget. Archived from the original on 19 September 2012. Retrieved 7 July 2009. ^ a b c d e f g h i Gallagher, Thomas (2002). Assault In Norway: Sabotaging the Nazi Nuclear Program. Guilford, Connecticut: The Lyons Press. ISBN 1-58574-750-5. Retrieved 12 July 2009. ^ a b c Berglyd, Jostein; Translated by Tim Dinan (2008). Operation Freshman: The Hunt for Hitler's Heavy Water. Solna: Leandoer and Eckholm. ISBN 978-91-975895-9-8. Retrieved 12 July 2009. ^ a b Riste, Olav; Nøkleby, Berit (1970). Norway 1940–45: The Resistance Movement. Oslo: Tano. ISBN 82-518-0164-8. ^ "Airborne Forces Museum in Aldershot". Airborne Assault ParaData. Archived from the original on 4 February 2017. Retrieved 3 February 2017. ^ a b Rhodes, Richard (1995). The making of the atomic bomb. Simon & Schuster. ISBN 978-0-684-81378-3. Retrieved 12 July 2009. ^ Haukelid, Knut (1989). Skis against the atom. Minot, North Dakota: North American Heritage Press. ISBN 0-942323-07-6. ^ British Embassy in Oslo (25 February 2014). "Sinking of DF Hydro 70th anniversary events in Norway". www.gov.uk. Retrieved 13 January 2016. ^ a b "NOVA: Hitler's Sunken Secret". The Corporation for Public Broadcasting – WGBH Educational Foundation. 1996–2005. Archived from the original on 12 July 2009. Retrieved 12 July 2009. ^ a b BBC TV documentary about the raid based on the survival skills, who actually interviewed the saboteur / "pursuer"
^ "Kulturhistorisk Stedsanalyse For Og Hotodden Kommuner" (PDF). p. 34. Archived from the original (PDF) on 9 September 2015. ^ a b NOVA (8 November 2005). "Hitler's Sunken Secret (transcript)". NOVA Web site. Archived from the original on 17 September 2008. Retrieved 8 October 2008. ^ "Joachim Ronneberg: Norwegian who thwarted Nazi nuclear plan dies". BBC News. 22 October 2018. ^ Higgins, Andrew (20 November 2015). "WWII Hero Credits Luck and Chance in Foiling Hitler's Nuclear Ambitions". The New York Times. Retrieved 4 February 2016. ^ Rhodes, Richard (1986). The Making of the Atomic Bomb. New York, NY: Simon and Schuster. pp. 455–457, 512–517. ISBN 9781439126226. Archived from the original on 9 September 2015. ^ "Kampen on tungtvannet". IMDb. Archived from the original on 29 January 2010. Retrieved 15 February 2009. ^ Corera, Gordon (25 April 2013). "Last hero of Telemark: The man who helped stop Hitler's A-bomb". BBC News. Archived from the original on 10 March 2016. Retrieved 4 February 2016. ^ "Saboteurs review – complex drama of wartime nuclear collaboration". The Guardian. Archived from the original on 21 July 2015. Retrieved 18 July 2015. ^ "Anna Friel, Frank Kjosås Board Norwegian Sabotage TV Series". Archived from the original on 21 July 2015. ^ "NRK ready to declare €8.7 million Heavy Water War". Archived from the original on 23 September 2015. ^ "Trailer: The Heavy Water War". Archived from the original on 13 January 2016. ^ Arts, Electronic (18 October 2018). "Battlefield V War Stories: Nordlys". Electronic Arts Inc. Retrieved 7 December 2018.